Buying your first (and possibly only) bespoke suit is what marketers call a ‘high consideration’ purchase, meaning that the average male will research the bejesus out of the market before ever stepping foot in one of the many venerable tailors shops this town is blessed with. 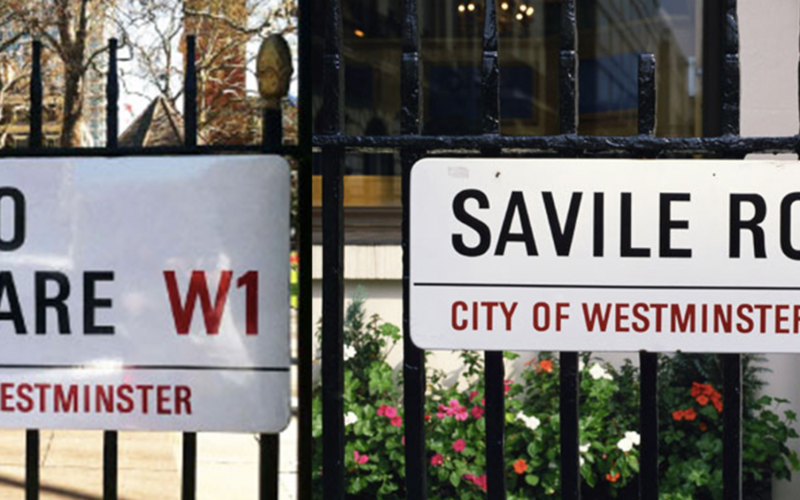 For many, the first search they’ll run on Google is for Savile Row Tailors – Savile Row of course being – by a stretch – the most famous street in the world for bespoke tailoring. When you buy a suit on Savile Row, you’re buying not just a suit, but into history, for example Winston Churchill commissioned his famous ‘Tommy Gun’ chalk stripe suit from Henry Poole & Co.
Delve a little deeper into the fabric (sorry) of the tailoring world in London though and you’ll find a close relationship between Soho Tailors & Savile Row. Many of the Soho Tailors trained at the famous tailoring shops on Savile Row and make their suits in exactly the same way, to the same exacting standards, using the same cloth suppliers. Of course, tailors located in Soho offer a rather different purchase experience to ‘The Row’. Many sprung up in the swinging sixties and the tailoring shops here tend to reflect the ethos of Soho itself – bohemian, creative, informal, with a tendency towards self-expression. Consequently the suits Chris Kerr makes range from traditional two piece wedding suits (perhaps with a personalised lining) right up to the leopard skin dinner jacket made for Michael Palin recently. It’s no surprise that Soho tailors have a large clientele of creative types – actors, musicians, tv personalities and a lot of their work is creating bespoke pieces for film & stage. What all customers will find in Soho, whether they’re famous actors, business people or a groom ordering a wedding suit, is a chance to specify exactly what they want, without the restrictions of a house style.